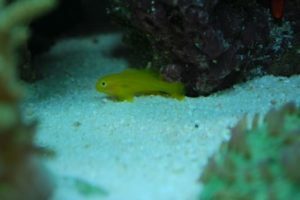 Yellow Clown Goby are excellent fish for any salt water fish keeper. They are typically reasonable in prices and are a good hearty fish once past the initial acclimation and quarantining process. These fish show tons of personality and do not tend to be shy fish once they are comfortable in their tank. This makes them a great addition to most tanks. Yellow Clown Goby from Captive Aquatic Ecosystems, LLC. on Vimeo. Where is the Yellow Clown Goby Found? 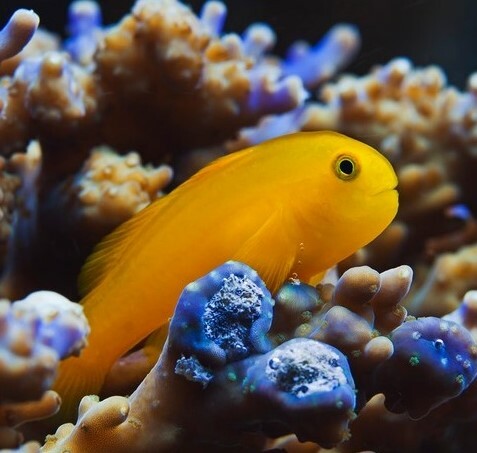 Are Yellow Clown Goby reef safe? What do Yellow Clown Goby eat? 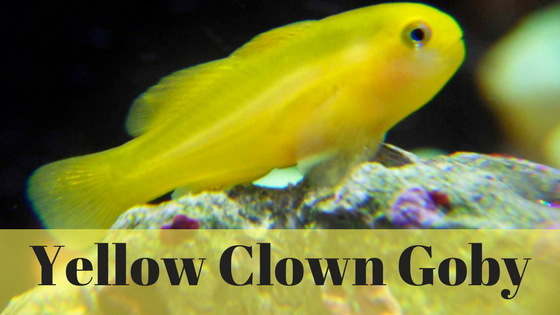 What type of behavior can you expect from a Yellow Clown Goby? How do Yellow Clown Gobys reproduce? What are some good Tank Mates for the Yellow Clown Goby? What is the Lifespan of a Yellow Clown Goby? What Tank size is recommended for the Yellow Clown Goby? The Yellow Clown Goby originates can be found in its natural habitat from southern Japan to the Great Barrier Reef. It makes its home among the coral reefs of this region and can often be found perched on the branches of Acropora coral. Yes, these fish are reef safe. Their natural environment is the reefs of the southern pacific. Although they are known to nip at the polyps of some SPS (Small Polyp Stony) coral; a well feed well maintained tank with a couple pieces of coral for the goby to nest in should not have any issues. Just like many of their cousin goby’s, the Yellow Clown Goby are carnivores but due to their small size they are really classified as planktivore. This means they feed a lot on mesoplankton, these are the diverse species of organisms that live in the water but are too small to swim against the current. They will also feed on copepods, brine shrimp, mysis shrimp, and a variety of finely chopped meaty foods. Feeding live foods occasionally is great for them, but they can also live on frozen meaty fish food. They will not eat on pellets or flake food. It is best to quarantine any new addition to your tank. The Yellow Clown Goby though is easily stressed by the purchase, transportation, and quarantining process. Make sure when purchased from a local fish store that you ask to see them feed and ensure it has a good appetite. Drip acclimate them to your tank and keep an eye on them in your quarantine tank making sure they keep their appetite. It is best to give them plenty of hiding spots during this time and a good supply of live meaty foods will help with this process. These fish do not act like many of their goby cousins. Rather than hanging out in the sand at the bottom of the tank these guys will tend to stay out and visible. Give them plenty of places to hide and they will feel comfortable enough to stay out in the open. They like to perch in the branches of your coral, especially in those of an Acropora coral. After a while in the tank they will begin to recognize their owner and will have plenty of personality and are even known to interact and do what some would call begging for food. How do Yellow Clown Goby reproduce? 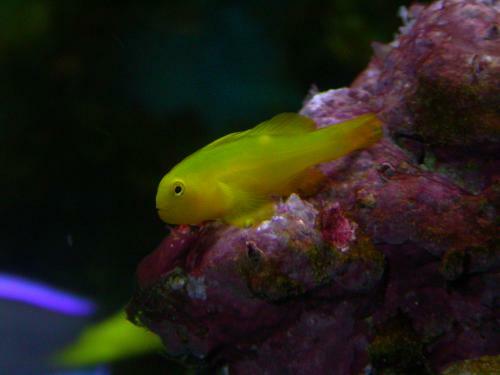 The yellow Goby can and will change its gender to ensure reproduction is possible. This puts them in the classification of protogynous hermaphrodites. At birth they are all born female. As they grow and pair off the smaller of the two will change, becoming a male. If their mate passes and a new mate is found they can change again. In the case of two males, the large will become female. When this happens with two females again the smaller will become male. This trait allows them to reproduce at a high rate. It has been recorded in some areas for a small clutch of these fish to double their population in an area in a year’s time. This fact coupled with the fact that they will breed in captivity has led to them being a good choice for the cost conceive fish keeper. There are several fish in this family that have similar body shape with different coloring patterns like the Green Clown Goby, or the Panda Goby; but their behavior is different and are thus classified as their own type of goby and not truly a color variation the Yellow Clown Goby. Whether you are looking for something new for your established tank or are a new fish keeper starting your first nano tank. 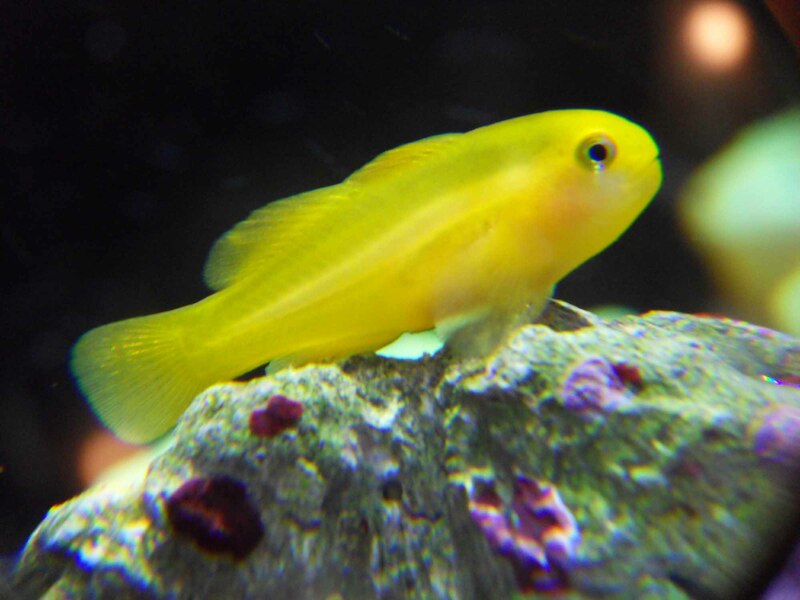 The personality and size of the Yellow Clown Goby makes it a great choice. What is your experience with this fish? Let me know in the comments below.